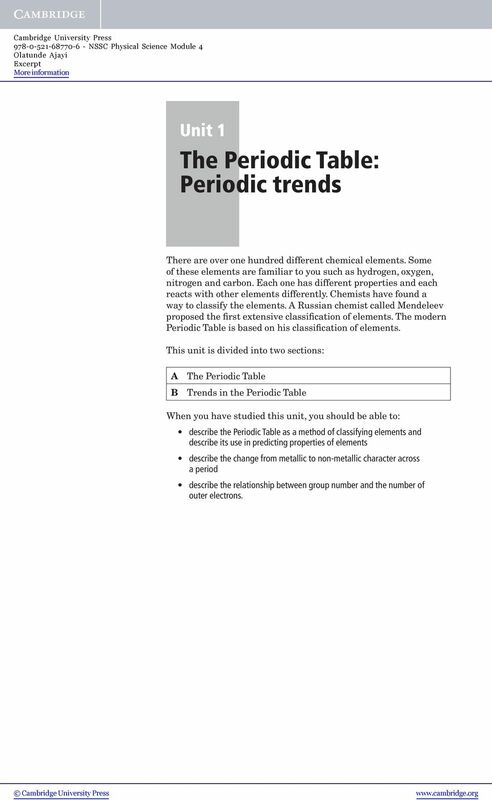 Download "The Periodic Table: Periodic trends"
1 Unit 1 The Periodic Table: Periodic trends There are over one hundred different chemical elements. Some of these elements are familiar to you such as hydrogen, oxygen, nitrogen and carbon. Each one has different properties and each reacts with other elements differently. Chemists have found a way to classify the elements. A Russian chemist called Mendeleev proposed the first extensive classification of elements. The modern Periodic Table is based on his classification of elements. This unit is divided into two sections: A The Periodic Table B Trends in the Periodic Table When you have studied this unit, you should be able to: describe the Periodic Table as a method of classifying elements and describe its use in predicting properties of elements describe the change from metallic to non-metallic character across a period describe the relationship between group number and the number of outer electrons. 3 Module 4 Unit 1 3 Newlands also grouped oxygen with iron, which did not have any common properties. Mendeleev arranged the elements in order of increasing relative mass, putting elements with similar properties underneath one another. He suggested that some elements were still undiscovered and left gaps for them on his table. He predicted the likely properties of the missing elements based on the properties of the elements above and below them on the table. Group Period I II III IV V VI 1 H 2 Li Be B C N O 3 Na Mg Al Si P S 3 K Ga?? 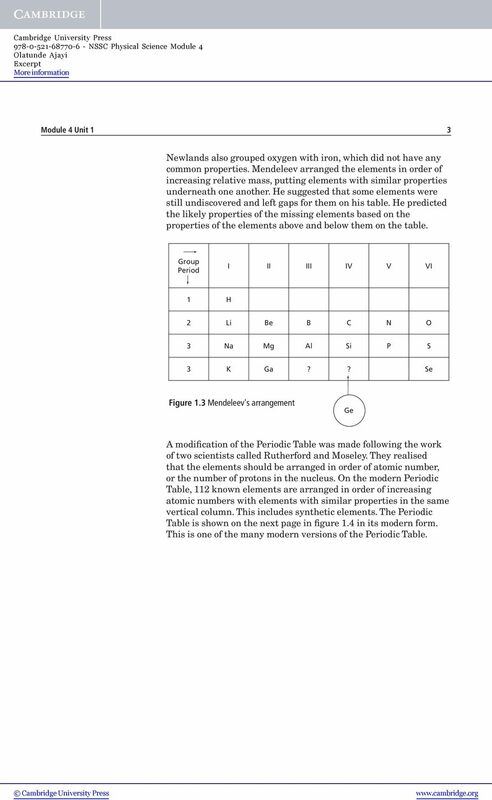 Se Figure 1.3 Mendeleev's arrangement Ge A modification of the Periodic Table was made following the work of two scientists called Rutherford and Moseley. They realised that the elements should be arranged in order of atomic number, or the number of protons in the nucleus. On the modern Periodic Table, 112 known elements are arranged in order of increasing atomic numbers with elements with similar properties in the same vertical column. This includes synthetic elements. 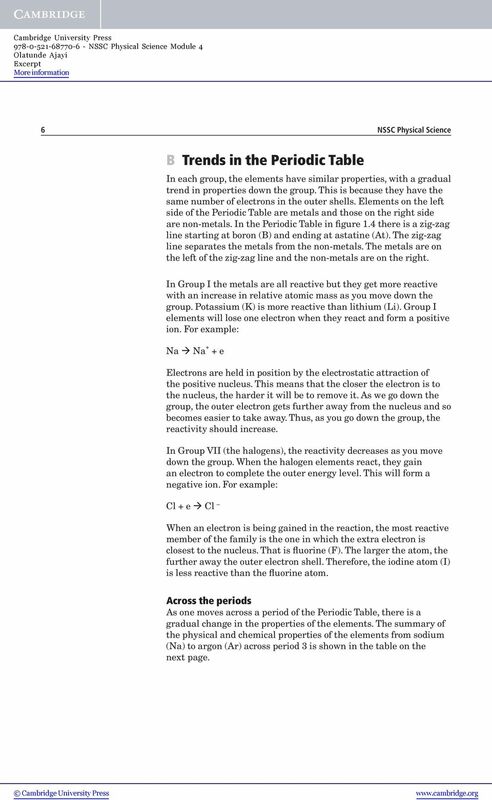 The Periodic Table is shown on the next page in figure 1.4 in its modern form. 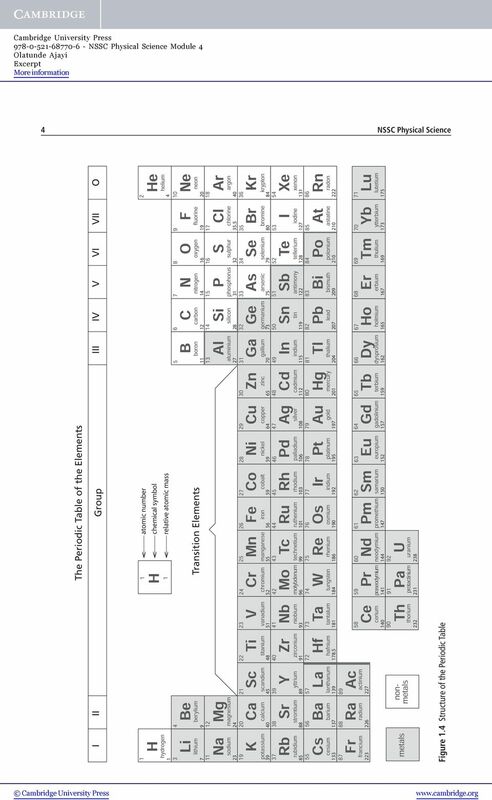 This is one of the many modern versions of the Periodic Table. 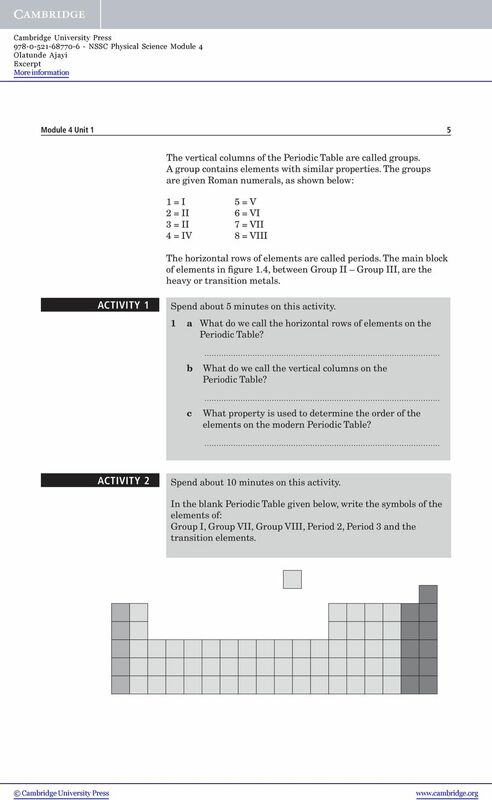 5 Module 4 Unit 1 5 The vertical columns of the Periodic Table are called groups. A group contains elements with similar properties. The groups are given Roman numerals, as shown below: 1=I 5=V 2 = II 6 = VI 3 = II 7 = VII 4 = IV 8 = VIII The horizontal rows of elements are called periods. The main block of elements in figure 1.4, between Group II Group III, are the heavy or transition metals. ACTIVITY 1 Spend about 5 minutes on this activity. 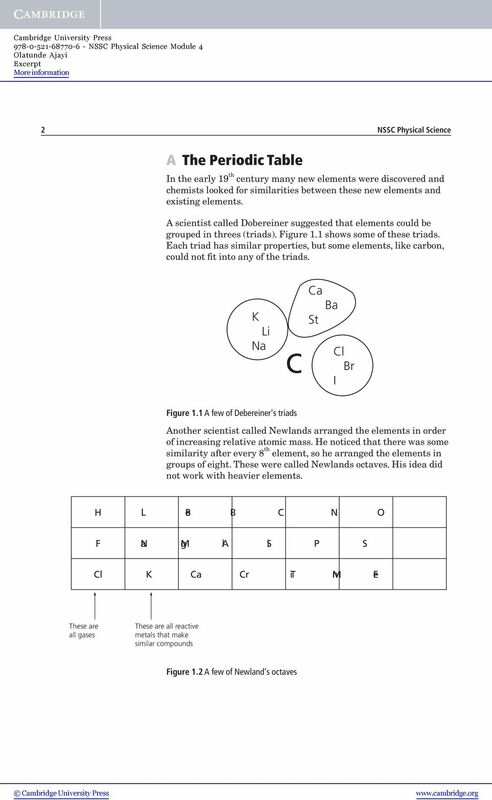 1 a What do we call the horizontal rows of elements on the Periodic Table? b What do we call the vertical columns on the Periodic Table? 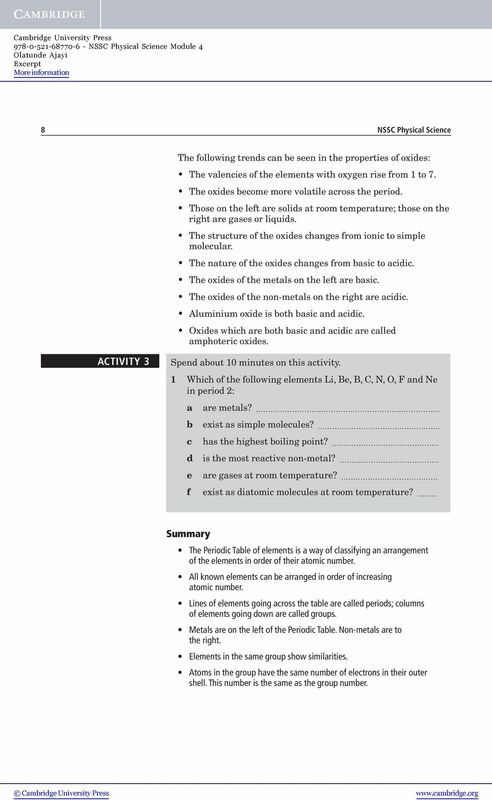 c What property is used to determine the order of the elements on the modern Periodic Table? ACTIVITY 2 Spend about 10 minutes on this activity. In the blank Periodic Table given below, write the symbols of the elements of: Group I, Group VII, Group VIII, Period 2, Period 3 and the transition elements. 6 6 NSSC Physical Science B Trends in the Periodic Table In each group, the elements have similar properties, with a gradual trend in properties down the group. This is because they have the same number of electrons in the outer shells. Elements on the left side of the Periodic Table are metals and those on the right side are non-metals. In the Periodic Table in figure 1.4 there is a zig-zag line starting at boron (B) and ending at astatine (At). The zig-zag line separates the metals from the non-metals. The metals are on the left of the zig-zag line and the non-metals are on the right. In Group I the metals are all reactive but they get more reactive with an increase in relative atomic mass as you move down the group. Potassium (K) is more reactive than lithium (Li). Group I elements will lose one electron when they react and form a positive ion. For example: Na Na + +e Electrons are held in position by the electrostatic attraction of the positive nucleus. This means that the closer the electron is to the nucleus, the harder it will be to remove it. As we go down the group, the outer electron gets further away from the nucleus and so becomes easier to take away. Thus, as you go down the group, the reactivity should increase. In Group VII (the halogens), the reactivity decreases as you move down the group. When the halogen elements react, they gain an electron to complete the outer energy level. This will form a negative ion. For example: Cl+e Cl When an electron is being gained in the reaction, the most reactive member of the family is the one in which the extra electron is closest to the nucleus. That is fluorine (F). The larger the atom, the further away the outer electron shell. Therefore, the iodine atom (I) is less reactive than the fluorine atom. Across the periods As one moves across a period of the Periodic Table, there is a gradual change in the properties of the elements. 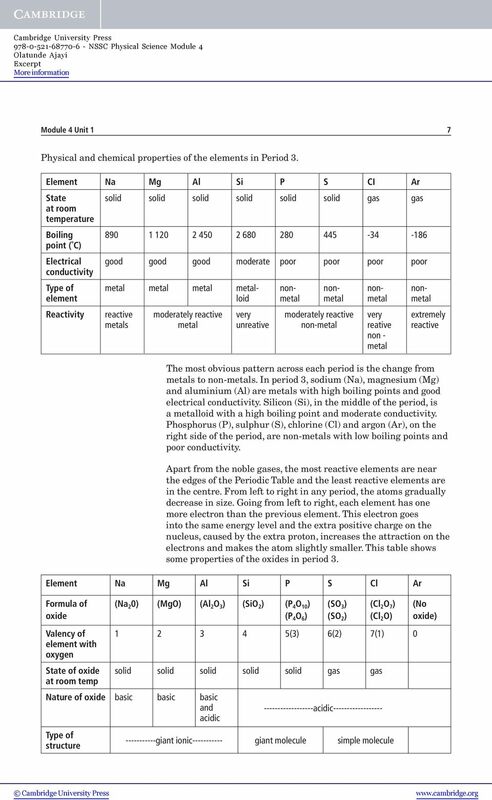 The summary of the physical and chemical properties of the elements from sodium (Na) to argon (Ar) across period 3 is shown in the table on the next page. 8 8 NSSC Physical Science The following trends can be seen in the properties of oxides: The valencies of the elements with oxygen rise from 1 to 7. The oxides become more volatile across the period. Those on the left are solids at room temperature; those on the right are gases or liquids. The structure of the oxides changes from ionic to simple molecular. The nature of the oxides changes from basic to acidic. The oxides of the metals on the left are basic. The oxides of the non-metals on the right are acidic. Aluminium oxide is both basic and acidic. Oxides which are both basic and acidic are called amphoteric oxides. ACTIVITY 3 Spend about 10 minutes on this activity. 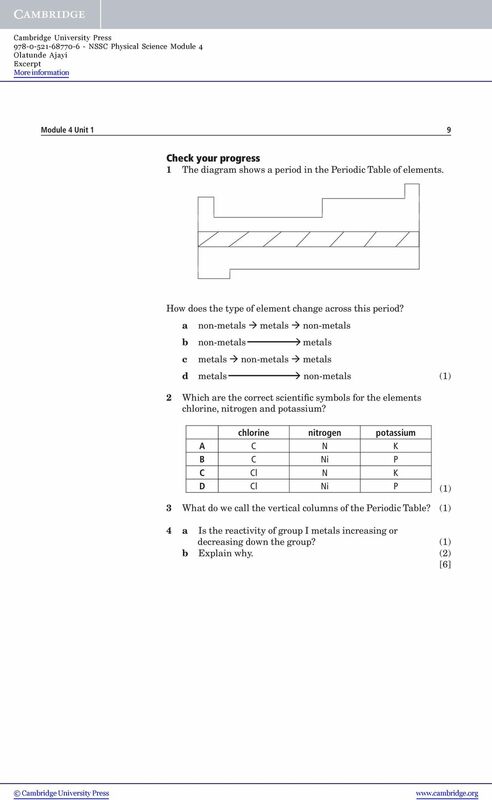 1 Which of the following elements Li, Be, B, C, N, O, F and Ne in period 2: a b c d e f are metals? exist as simple molecules? has the highest boiling point? is the most reactive non-metal? are gases at room temperature? exist as diatomic molecules at room temperature? Summary The Periodic Table of elements is a way of classifying an arrangement of the elements in order of their atomic number. All known elements can be arranged in order of increasing atomic number. Lines of elements going across the table are called periods; columns of elements going down are called groups. Metals are on the left of the Periodic Table. Non-metals are to the right. Elements in the same group show similarities. Atoms in the group have the same number of electrons in their outer shell. This number is the same as the group number. 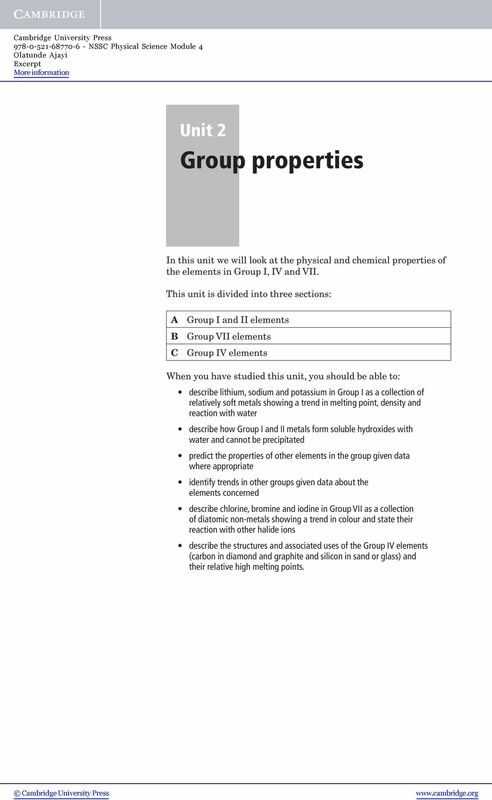 10 Unit 2 Group properties In this unit we will look at the physical and chemical properties of the elements in Group I, IV and VII. This unit is divided into three sections: A Group I and II elements B Group VII elements C Group IV elements When you have studied this unit, you should be able to: describe lithium, sodium and potassium in Group I as a collection of relatively soft metals showing a trend in melting point, density and reaction with water describe how Group I and II metals form soluble hydroxides with water and cannot be precipitated predict the properties of other elements in the group given data where appropriate identify trends in other groups given data about the elements concerned describe chlorine, bromine and iodine in Group VII as a collection of diatomic non-metals showing a trend in colour and state their reaction with other halide ions describe the structures and associated uses of the Group IV elements (carbon in diamond and graphite and silicon in sand or glass) and their relative high melting points. A 1.008 g sample of H contains 6.0221415 x 10 23 H atoms. How much does a single atom weigh? Different elements weigh different amounts related to what makes them unique. Molecules, Atoms, Grams and Mole Calculation Practice Helpful HINTS: In these problems look for two things: 1) From what unit to what unit? 2) Does the object stay the same, or does the object change? University of Pittsburgh Safety Manual Subject: COMBUSTIBLE METALS. EH&S Guideline Number: 02-005. Effective Date 09/10/13.